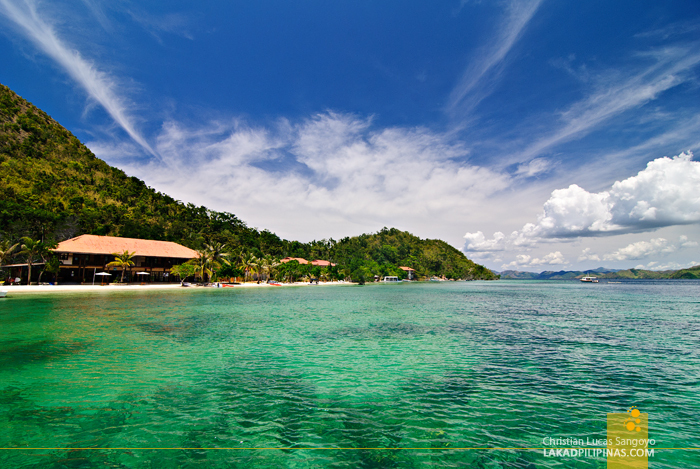 Deep blue skies and sparkling emerald waters welcomed us to Palawan. 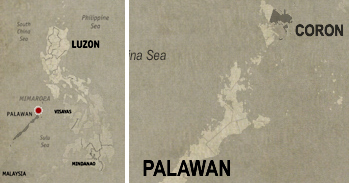 I can’t remember how many times I’ve been to the so called Last Frontier of the Philippines, but it still amazes me beyond words. This time, together with members of the Philippine Tour Operators Association (Philtoa), I got to explore the mostly seldom visited and most expensive parts of Coron and Busuanga. 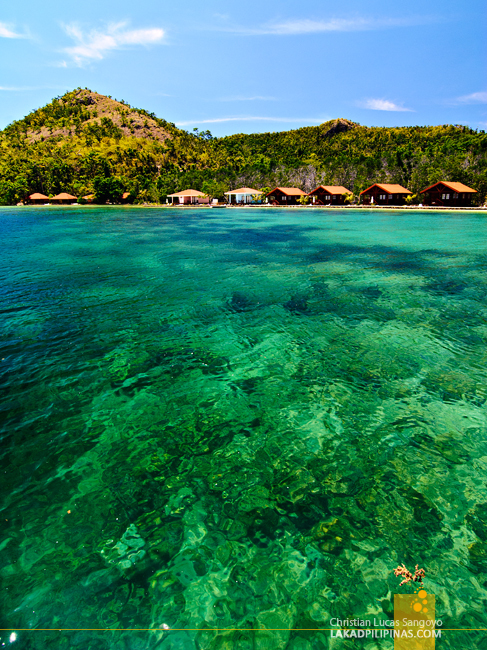 Our first stop for the five-day Northern Palawan Eco-Adventure Discovery Tour is the El Rio y Mar resort. 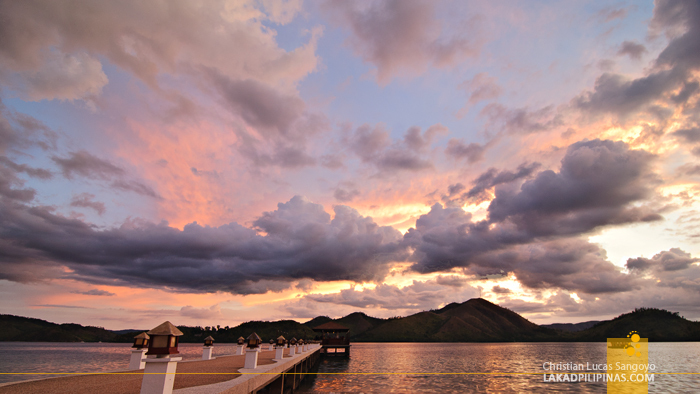 Straight from the 40-minute flight from Manila via Skyjet, we were fetched by the crew of El Rio y Mar Resort. From the van, we hopped on a motorized outrigger boat. 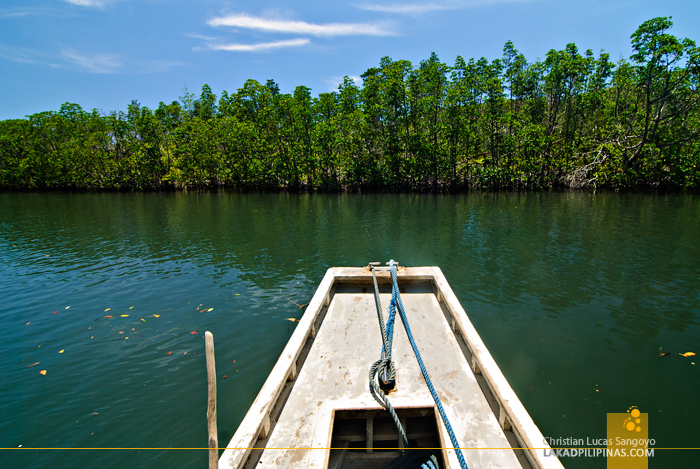 With sandwiches and refreshments handed out, we proceeded to navigate the mangroves of Busuanga River in Barangay San Jose. The roundtrip transfer from the airport to the resort costs $30.00 per person. 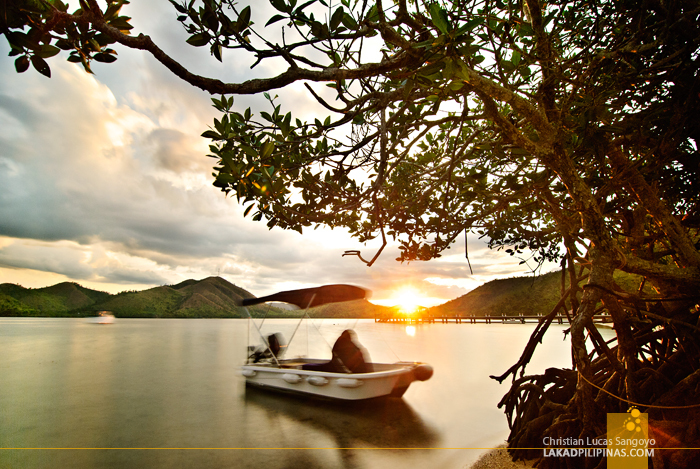 Our boat emerged at the Maribacan Bay and the water turned from dark greens to emeralds. The landing dock of El Rio y Mar was not far from sight and we can already see the resort where we would be staying for the night. To say everyone was excited was an understatement. The water was just amazing! El Rio y Mar, translated from Spanish means the River and the Sea. And that’s just what it is. 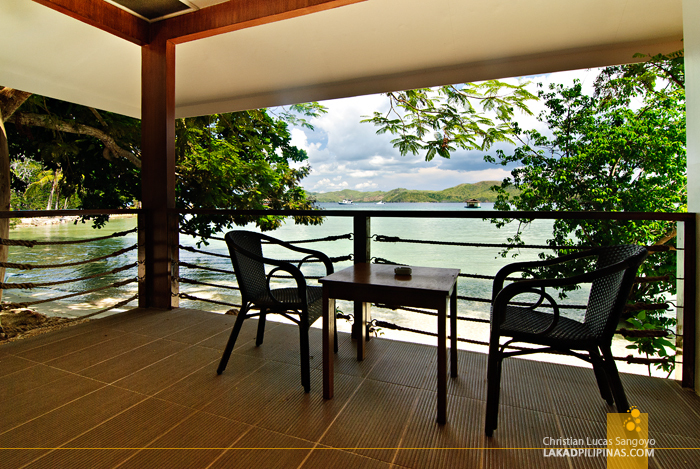 Located on a roadless part of Coron, the resort can only be accessed by navigating a mangrove river and the Maribacan Bay, which opens to the Sea of Sulu. The resort is perfect for tourists who want a very private vacation. Lunch was the first order of the day. The resort has its own al fresco restaurant where a buffet was served. 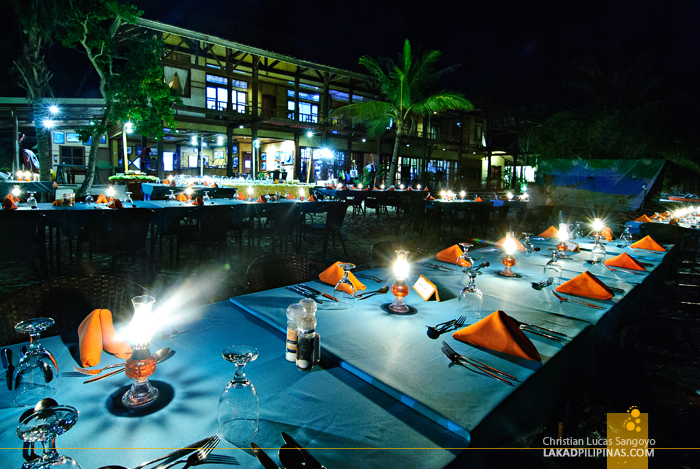 Guests really have no choice when it comes to dining in El Rio y Mar as there are no other restaurants in the area. The place is so secluded you’d have to go by boat if you plan to eat outside. 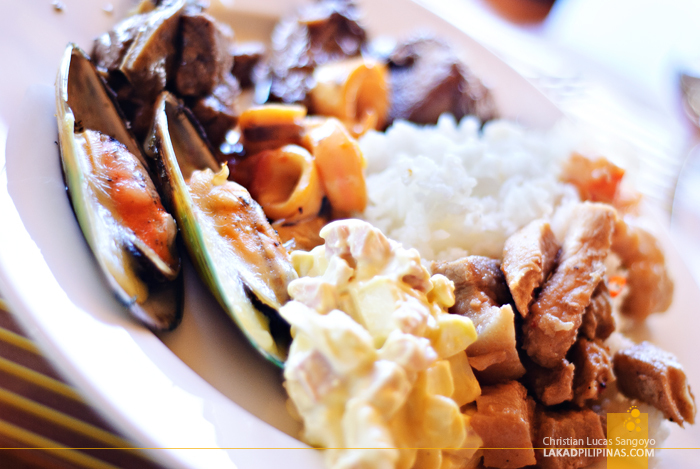 Good thing they serve quality dishes which are already included with the room rates. 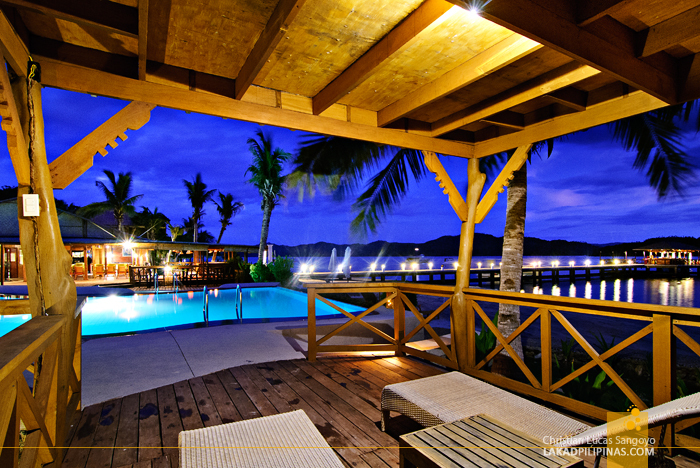 With bellies full, we proceeded to our cabanas which are located on the left side of the resort. 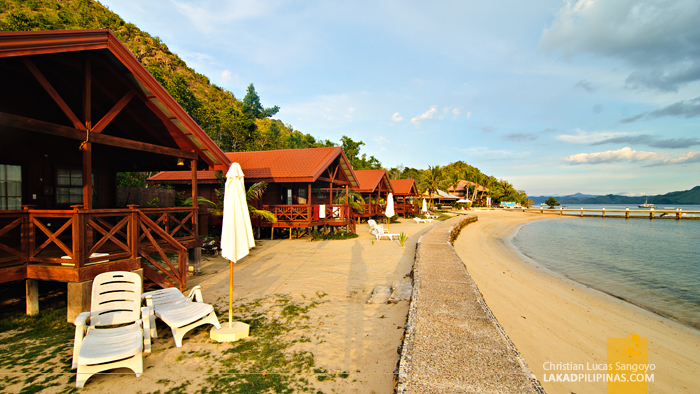 These are duplex-type lodgings complete with balconies overlooking the beach. Our room costs $230.00 for one person. You have to add another $180.00 for every additional head. 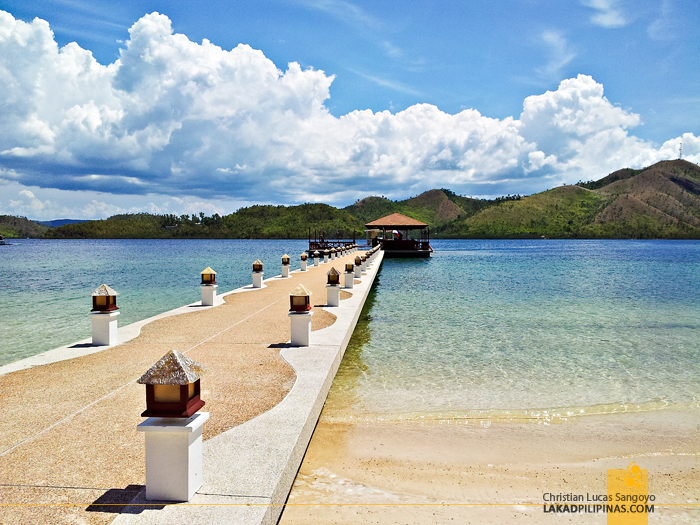 So that’s around Php17,000++ per night for two persons, inclusive of full board meals, whew! 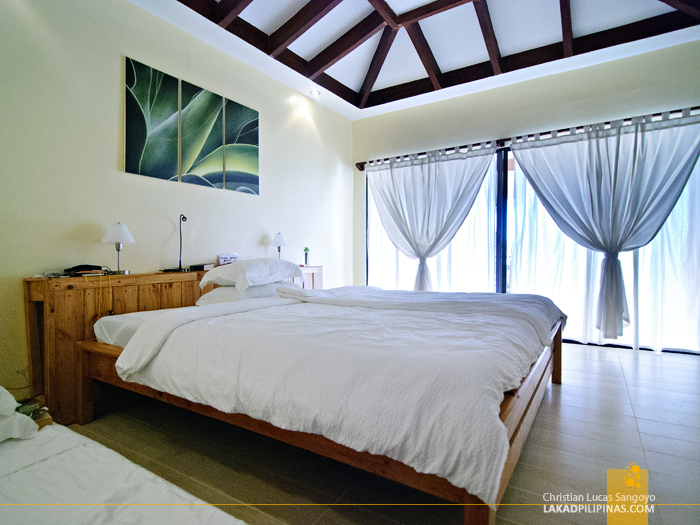 The sparsely decorated interiors are airy and spacious. There’s a queen-sized bed and a pull-out for a third guest. The wall facing the sea has a floor to ceiling glass door that creates that indoor-outdoor feel. You can, of course, close it with the drapes should you want some privacy. The toilet and bath are also quite spacious. 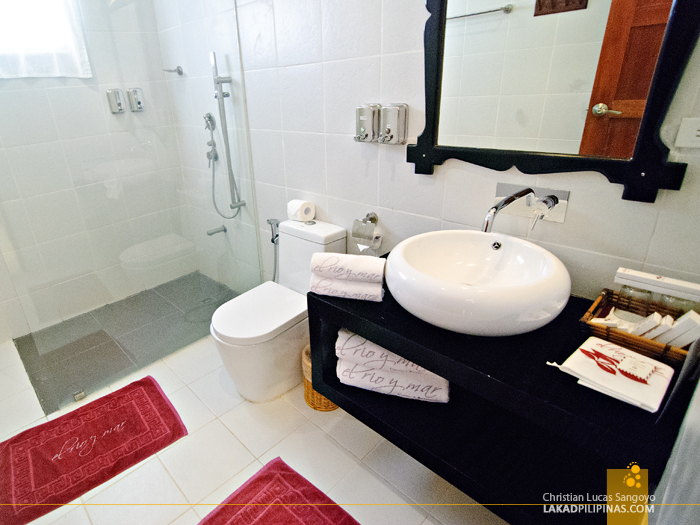 Toiletries are all provided for and there’s a bidet for the picky traveler. Hot and cold water’s available; and yes, besides the telephone shower, they have a rain showerhead. Love! I was rarin’ to strip my clothes off and dive at the waters of El Rio y Mar the moment I stepped off its wharf. And now that everything’s in order, I took out my Baywatch buoy, slipped on my snorkel and mask, and ran to the beach, unmindful of the midday sun beating hard on my back. If the surface of El Rio y Mar’s beach wowed us, the world below it was more stunning. After some minutes of swimming, going into the deeper parts of the water, I saw hundreds of fishes swirling in unison. I have no idea what species these were, but they were incredibly hypnotic. My only regret was that I don’t have an underwater camera anymore—the first one got busted while snorkeling in Babuyan Island and the other at Phuket’s Patong Beach. Beh. With my skin scorched, I laid down on a recliner right beside the beach and waited for the sun to set. Quickly, I dozed off and was left behind by my companions. I didn’t know that there’s a hill at the back of the resort where one can hike for a panoramic view of the bay. I woke up just as the sky was painted with all kinds of pastels. Soon, dark blues ruled the heavens and I decided to try El Rio y Mar’s infinity pool. While I can say nothing bad about it, my experience under the sea made their pool ordinary. But I wanted to swim some more and beggars really can’t be choosers. It wasn’t long before we were being called again to the table. This time, we’re gonna eat right beside the beach. A set was spread for the guests, all under candle light. And yup, it’s buffet time once again. 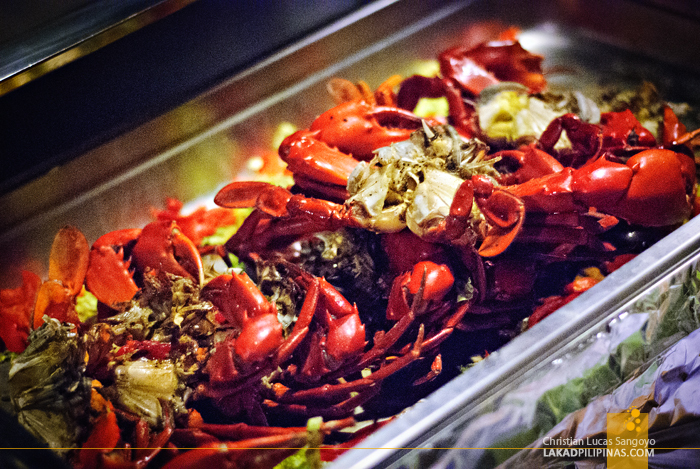 As the staff of El Rio y Mar provided us with songs and dances, we in turn filled our plates with all sorts of seafood goodness. I’m not a big fan of crabs, but by gosh, I love the ones they serve here! I guess it really helps to enjoy it more when you each have pincers to crack your crabs with. The night ended at the far end of El Rio y Mar’s beach. 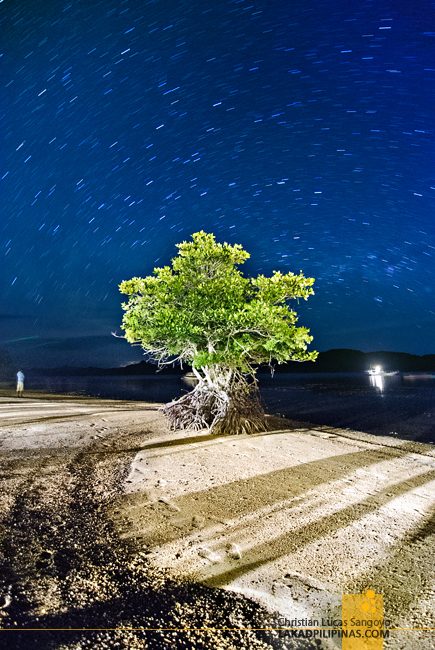 As I suspected, the resort being located at one of the remotest parts of Coron, the stars here shine as bright as can be. With my camera and tripod in tow, I tried capturing Palawan’s heavens until I was called back by my companions; it was time to plan our second day in Palawan. ang ganda!!! sana makapunta ako dito. Yakang yaka mo naman ang per night dyan atty!